An additional 16 channels of ADAT Optical I/O are available to add Lightpipe-equipped digital gear, or extend your analog I/O to 48x48 by connecting two PreSonus DigiMax DP88 A/D/A converters with recallable XMAX Class A preamps and line-level inputs. BNC word clock I/O and low-jitter clocking ensure the Quantum 4848 and other digital audio devices operate in tight sync for superior imaging. The unit’s front-panel level meters can be switched between input and output monitoring. For applications requiring more than 48 channels, up to 4 Quantum 4848 interfaces can be stacked via Thunderbolt to create a 192x192 system. Alternatively, the Quantum 4848 can be stacked with any Quantum-series interface to add recallable XMAX mic preamps, SPDIF I/O, and MIDI I/O. The Quantum 4848’s second Thunderbolt port also can be used to add peripherals such as hard drives. As with other Quantum-series interfaces, the Quantum 4848 uses proprietary Thunderbolt™ drivers for macOS® and Windows® to deliver ultra-low-latency performance while maximizing efficiency. Even at higher buffer sizes, Quantum-series interfaces deliver consistent low-latency performance. DAW monitoring allows you to manage your session and your musicians’ monitor mixes from a single window. The Quantum 4848 is compatible with any recording software that supports Core Audio (macOS) or ASIO (Windows) and includes PreSonus’ Studio One Professional to provide you with a complete recording solution, from tracking to mastering. Studio One Professional’s Pipeline plug-in lets you insert hardware processors into your Studio One session with automatic latency compensation, so your outboard gear can be used with the same flexibility as a plug-in in your session. You also get the Studio Magic Plug-in Suite, a collection of seven plug-ins from leading developers. Some DAWs limit your I/O access when you use third-party audio interfaces. The Quantum 4848 resolves this by providing three Channel Profile modes that allow you to adapt the input and output channel configuration when the application you’re using limits you to 32 inputs and outputs. Set the Quantum 4848 to use 32 analog inputs with 16 channels of ADAT, 24 analog inputs with 8 channels of ADAT, or 16 analog inputs with 16 channels of ADAT to customize the assortment of analog and digital inputs for your needs. Or launch Studio One Professional to record up to 192 simultaneous inputs. 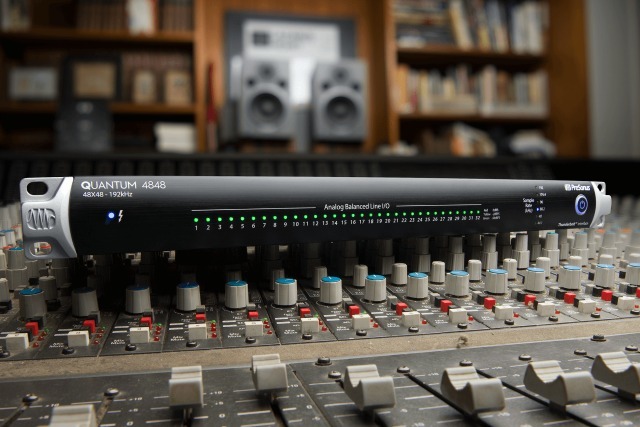 The Quantum 4848 is available immediately at PreSonus dealers for an anticipated U.S. street price of $1,499.95.